After the case file was read by the clerk, the counsels introduced themselves. Barrister Chika and Ifeanyi Ejiofor are standing for the first and second respondents respectively: namely, David Nwawusi and Benjamin Madubugwu. The acknowledgement copy of the motion filed by Barrister Chika for Citizen David Nwawuisi was submitted to the presiding judge, while Hon Ejiofor rose to make his case. Barrister Ejiofor: "The first respondents filed an objection which is dated on the 14th day of June 2016 and all processes are before our Lordship." "We are moving it pursuant to item 7 rule 3 of the fundamental human right and it is before you. My Lord in response to the PRE objection of the first respondents, the applicant has filed a 24 paragraph affidavit. We are relying on exhibit Nd1, after being on detention for over six months and it is dated 22rd day of June 2016. We are relying on all the argument canvassed therein,in pursuant to determine the so issue,if its right to keep the defendants on detention for over six months. "My Lord, the second respondent filed an objection 17th day of June 2016. We are relying on pursuant to item seven of the fundamental human right. "My Lord, we have in pursuant to section 6 sub 6 and section 36,42 in the 1999 constitution of Nigeria, pursuit 1,2,3 of the fundamental human right, 4,5,6,7b and d of the Africa charter of peoples right. My lord, in compliance of these rules, we have filed application of the fundamental human right of the applicants. "I most humbly urge your lordship, to grant this application. My lord in support of the motion, we have filed 19 day of September 2016. My lord we are relying on our arguments, for the defendants to be released, through fundamental human right. "The 1st respondent filed a counter affidavit on 14th day of June 2016. The counter affidavit is of 24 paragraphs, posted by Emmanuel Ayiola. 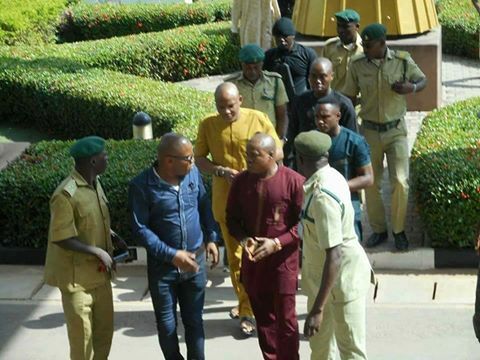 My lord,I humbly demand that the first respondents should be released," Barrister Ifeanyi Ejiofor stated. "My lord, the second defendant also filed a counter affidavit on the 9 day of September 2016, which has 24 paragraphs. My lord, we urge this honourable court to release the defendant, because for someone to be detained for such long period of time is against human right. My lord, we shall be moving his lordship to pursuant item 7 on the fundamental Human rights 2009. My lord, we have raised fundamental rule, to determine if his lordship is in position to hear this suit. We urge your lordship to dismiss, this hearing before the lordship. "First respondents also filed a counter affidavit to the suit, on the 19th of May, 2016, in pursuant to section 35,36,41,43,44 and 46 sub 1 or 2, of 1999 constitution as amended. Article 4, 5,6,7b and d of the African charter of human right. We have filed this in compliance of the fundamental human rights of the applicants and it is of 18 paragraphs, which was posted by Emmanuel. Also in support of it, is exhibit b1 and b2. "My lord, 1st respondent filed a counter affidavit dated 15th day of June. My Lord it was agreed that once the items collected from the 1st defendant is returned, it will be handed over to the family of the defendant and it is contained in paragraph 49." Having finished his plea, Ejiofor retired, while Barrister Chika took over, supporting the argument put forward by Ifeanyi Ejiofor. "My Lord, we have a motion which is dated 21st day of June 2016. "We filed a written address in support of the counter affidavit. In the address three issues were raised. My Lord we adopt our written address as our argument and urge this honourable court to strike out the application against the Second defendant," she admonished. Barrister Ejiofor afterwards stated that "the application filed by the prosecutor, is frivolous and have no basis, hence it should be struck out." The judge adjourned the case to 9th day of February 2016 for ruling. Meanwhile Nnamdi Kanu's case will be coming up around 1pm don't go away as Family Writers will update you on the upcoming proceedings. BEFORE NOW I HAD THOUGHT THAT HAUSA/FULANI/YORUBAS HAD LITTLE SENSE GENERALLY CALLED ''COMMON SENSE''AND UNTIL NNAMDI KANU CAME IN FOR BIAFRAN RESTORATION.BEHOLD,THE EMPTINESS OF THESE TRIBES AND PEOPLES REFLECTIONS ON NNAMDI KANU AND THE BIAFRA ISSUES HAS JUST EXPOSED SANDY/MUD BRAINS THAT SHALL SOON BE BLOWN AWAY BY THE EASTERN WIND CALLED BIAFRAN RESTORATION UNDER IPOB'S NNAMDI KANU.EVEN ALL THE FALSE PROPHETS IN YORUBALAND AND ALPHAS/MARABOOS OF ISLAM AND THEIR OCCULT PRACTICTIONERS CANNOT SAVE NIGERIA FROM THE ZIONIST STATE OF BIAFRA. SHAME,SHAME SHAME ON ALL PROPONENTS OF SATANIC ONE-ZOO-NIGERIA! BIAFRA LIVES!! YOURS THE BIAFRAN RABBI.